Has anyone personally verified the weight on this plug? I'm not sure to be honest. ToyTimeTim has it and might be able to get you an accurate weight if you message him. 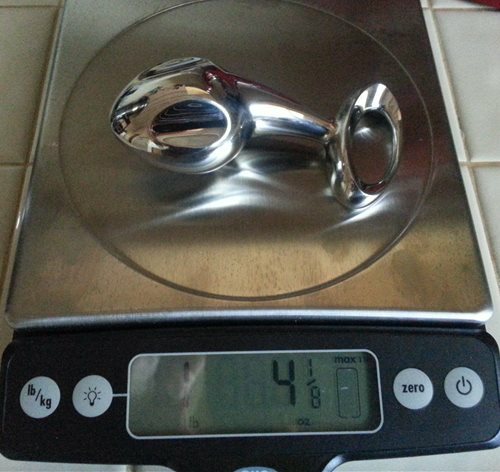 From the Njoy website, the Pure Plug 2.0 weighs 1.3 lbs. Eden has the weight listed incorrectly as 3 lbs. Eden must be including the packaging as opposed to the weight of the actual toy. 1 lb, 5 oz. I realized after my review that I stated it incorrectly. pretty sure it's 1.5 pounds. When I see lbs expressed with a decimal part, except for ".5," which I know means half a pound or 8 ounces, I don't know how many ounces the decimal represents. It would be more helpful if I know how many ounces I'm dealing with. But I found an easy way to convert the decimal to ounces: Just multiply the decimal by 16 (as in 16 ounces to a pound) to get the ounces. Thus, since the Pure Plug 2.0 weighs 1.3 lbs, when you multiply .3 by 16 you get 4.8. That means the Pure Plug 2.0 weighs 1 lb and 4.8 or about 5 ounces. Isn't that more meaningful than "1.3 lbs"? actually, no. oz are base 16 and we use base 10 in our life all the time.